ANNAPOLIS — A Frederick County honey producer wants the state to enact standards for the sweet substance. Byron Rice, owner of Lord Byron’s Honey near Thurmont, said much of the honey sold in stores is mixed with high-fructose corn syrup or cane sugar but labeled as honey. Rice is advocating for the state to follow Florida and California in enacting its own standards, rather than wait for the federal Food and Drug Administration to act. Similar standards are pending in Wisconsin and Texas, he said. It’s not just sweeteners that can get into honey — the state Department of Legislative Services said in its analysis of the bill that water can be added, and pesticides and antibiotics with potential health effects may be present in honey because of bad manufacturing practices. That’s particularly a concern when honey is imported from countries with different regulations in regards to antibiotic use. Antibiotics used on bees can get into honey, according to the state Department of Agriculture. Additionally, Rice said manufacturers heat honey to 150 degrees to mix in the corn syrup, which kills live enzymes in honey that he said can help people with allergies. Honey with additives such as corn syrup tastes the same as pure honey, Rice said, so consumers cannot tell the difference. Delegate Paul Stull, a Frederick County Republican, is sponsoring the bill and presented his proposal to the House Environmental Matters committee Wednesday. 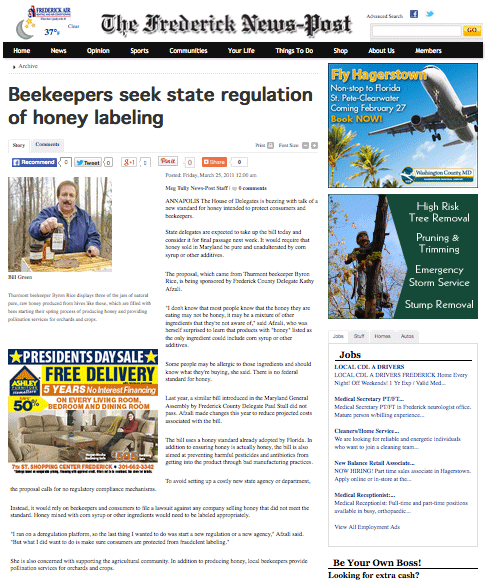 It would require the Maryland Department of Agriculture to adopt regulations with standards for products sold as honey. The standards would cover composition of the honey, quality factors, contaminants, hygiene, labeling and methods of sampling and analysis. In a letter of concern, the department stated enforcement of the bill would have a significant impact because the United States imports so much of its honey and it would require the department to collect samples, perform laboratory tests and take regulatory action. Stull thinks it would be worth the effort, however. “By allowing only pure honey to be sold in Maryland, Maryland’s pure honey manufacturers will thrive as adulterated and falsely advertised products are excluded from the market,” he said. Stull said the state should act to protect honey producers in part because they are needed for pollination of fruit trees.